From a werewolf sceptic, I really loved this book. The characters were well developed, the relationships felt real, and the plot had enough meat to it to keep me on the edge of my… well, bed. This is a book I’d be glad to have in my collection. I’ve never really been interested in werewolves. Everything that I’d seen them in previously, they’d always be playing second fiddle to vampires. That’s probably why I was completely Team Edward three years ago during my Twilight craze. I wouldn’t have even picked up this book if it weren’t for a friend of mine. Last time we were stalking our local library, she shoved it into my hands and told me to read it. Even so, I let it sit on my shelves until it was just about due back. When I finally picked it up, what I found was… well let’s just say I really should thank her now. As the title pretty much surmises, Bryn was raised by a pack of werewolves. Marked by the Alpha as a young child, the Pack accepted her into their fold. She’s tough, and a little unruly, having learnt how to hold her own. Using a mental barricade, she keeps the Pack’s dominance at bay. But when Chase, a boy turned wolf, shows up, she needs to get to know him. Wolves are only ever born, not turned, so Chase is an impossibility. Feeling an undeniable bond toward him, Bryn will need to let down her barricade if she wants to get closer. But things aren’t that easy. Pack politics must be obeyed, and as with politics, things don’t always go the way you want them to. The characters in this book are distinct and extremely well developed, but it’s done in a way that doesn’t leave you feeling like the plot is dragging. Callum as the Alpha, comes across stern and powerful, but also manages to hold onto a slab of caring and fairness. Devon brought the humour as Bryn’s best friend with a love of British accents, show tunes and high fashion. As Bryn calls him, ‘the only metrosexual werewolf’. Then there’s Chase. He’s the love interest, but it’s not the same kind of sappy insta-luv I’ve been seeing a lot of lately. It’s more instinctual. Chase and Bryn feel the need to protect rather than ravish one another. There is plenty of emotion flowing between them, that you can feel their connection without needing all of the insecure angst. I actually found their relationship touching. The romance isn’t the pull of the story however. There is a great plot to it, full of action and scheming. I liken it akin to a teenage-suitable version of Rachel Vincent’s Shifters series. The two series aren’t the same however; each has their own multifaceted, addictive stories to tell. 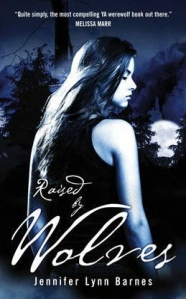 Raised By Wolves is probably the more fast paced of the two, which I really appreciated. I found myself grinning at the pages as plot twists unravelled. I genuinely loved Bryn as a character, she was easy to connect with, and had such a strong will for someone so young. I can’t wait to read Trial By Fire. I’ll definitely be buying myself a copy of both books, since I suspect the library will be wanting this one back very soon. Those who enjoy reading the inner workings of family dynamics, trust and deep-seeded bonds. If you’re unweary of the werewolf genre, this is the one to start with. YAY I’m really glad you liked it – thanks accepted. I knew this would be your kind of book! I didn’t like the first half, but really loved when Lake came into it. She was my favourite and I’ll be reading the second book just for her, haha.